I don't know about you, but I love my coffee! Here is a great deal to share some java with the coffee lovers in your life this holiday season! Shop 12 days of deals at StarbuckStore.com! For twelve days, Starbucks will be offering a special each day! Visit each day to see what's new! We've all heard of five star hotels and restaurants, but a five star gym? A five star, women only gym? It is true and it is located right here in San Diego! 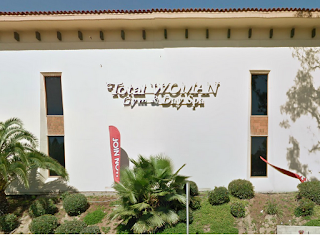 Total Woman Gym and Spa in Mission Valley is the perfect gym for women! Thanks to www.getfitsd.com, I was able to visit Total Woman Gym and Spa a few days ago for the first time. As I walked in the door, I thought to myself "wow, this looks like a spa!". The soft colors, the mini boutique what greets you, and the welcoming reception area was very inviting. The bottom floor is the workout area complete with cardio machines and strength training equipment. All the strength training equipment is specific to the size of a woman so it provides a more targeted workout. At the top of the grand spiral staircase is an ab workout area, a pilates, and yoga room. It's Thanksgiving Eve and Black Friday starts at about 26 hours from now, so...do you have your game plan ready? Me? No. I think I'm going to avoid the ridiculousness of the parking, lines, and overwhelming feeling of not being able to get what I want before the lady in front of me grabs it! So, below is the third installment of my favorite things to inspire you as your shop during this holiday season during the not-so-busy days! This is not only for gardeners my friends! This hand cream is great for your desk at the office or next to the kitchen sink. I hate hand cream that feels watery and doesn't last. This product is thick and rich, keeping your hands moisturized and soft for hours! The holidays are official here and Thanksgiving is just around the corner! I love crafts so I wanted to highlight some of the fun I've been a part of this past week! This past week my counseling staff hosted a Thanksgiving Luncheon for our entire staff of the high school where I work. Turkey sandwiches, cranberry salad, potato salad, stuffing, and Boozie Cakes were all a hit with everyone. Our decor got the most attention! Marti and Melina, two of the ladies I work with, better known as M&M Creations, but all the decorations together. One of the pieces they put together was a "thankful tree" where the staff was able to hang leaves with their "thanks" written. The tree was a branch of a real tree, spray painted black, and cemented into a plastic vase! Super cute! 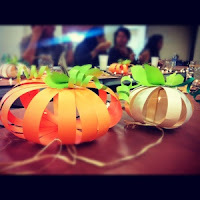 Also, M&M Creations made these cute paper pumpkins inspired by CraftSanity! 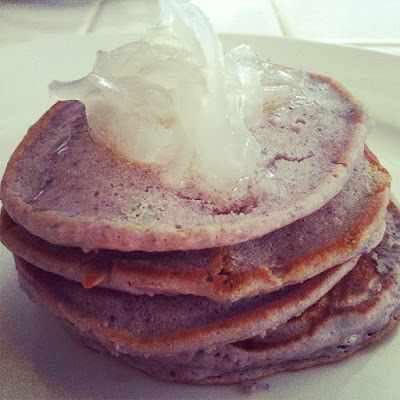 A few weeks ago, some friends had posted ube pancakes from a restaurant in LA. I was inspired to make my own! I took a recipe from Food Woody and changed a few things to make it my own! Sift dry ingredients in a mixing bowl. In another bowl, mix powdered ube and water until nice and thick. Add eggs, half and half, vanilla, coconut, and melted butter. Then add wet mixture to dry whisking until any lumps disappear. Red Lotus Mama thinks I deserve to be Pampered! Red Lotus Mama thinks I deserve to be pampered! Thanks to her I was able to attend Leu Leu Beauty Bar's VIP Grand Opening tonight! After weaving in and out of traffic on the 5N, cousin Baba and I made it safely! The Leu Leu Beauty Bar is super cute with the pink and turquoise decor! A DJ was mixing live, there was an array of appetizers, a candy bar, and refreshments. I loved the crepes from Bonaparte Crepes and the drinks from Blink Energy Water! Complimentary hair styling and mini-manicures were available for the guests. Lines were too long so Baba and I weren't able to try our those services. There were lots of guests so it was hard to walk around and check out the facilities. I had to hunt down a brochure too, they were hard to find. Last week, my first installment of Lysa's Favorite Things featured Whittard of Chelsea tea! Today, I'm adding the Emjoi Soft Caress Cordless Hair Remover. Who in their right mind would gift this to someone for Christmas?! A thoughtful husband for their wife or an observant daughter for their mother perhaps!? Any woman in your life who deals with facial hair would appreciate this gift! Because of genetics, I'm hairy. I'll admit it. I hate the pesky woman-stache and the hairs on my chinny-chin-chin. I was trying on saving money on frequent visits for hair threading or waxing on my face so I thought on buying a hair removal product. After doing some research online, I came across Emjoi Soft Caress Cordless Hair Remover. Run #11 of 12 - Iron Girl! I'm at the home stretch, FINALLY! I can't believe the year is almost over and I'm almost at the completion of my 2012 resolution! My run #11 of 12 for 2012 was the Iron Girl Del Mar. The morning started out clear and crisp. Cold, so cold, I wore three layers the entire run/walk. It was a great atmosphere of all women runners/walkers, all shapes and sizes, all ages from the youngest 5 year old to more than a few ladies rocking the wrinkles and grey hair! Being around all women in events like this is very empowering. Seeing all different types of women challenging themselves physically is encouraging. I have a very close knit group of college friends who I have the best time with! Even though its been about 13 years since we've graduated from college, we're all still very close. I've shared some of the best times of my life with them. The best tear-jerking, side- splitting laughs I've had are with these friends. For a long time now, we've been talking about starting a writing club amongst us. We'd pick a topic peridically, write, share with each other, and vote for the best. Winner then gets to pick a dinner out compliments of the losers. So, last week we finally committed. The topic is: Life Mottos. Instead of having each other vote, we decided to let the cyber-world vote for the best. So, take some time to read the four entries below and in the comments at the bottom, choose your favorite! As Christmas time is approaching, many of us are thinking of what to gift our favorite people! So, over the next few weeks, I'll be doing my version of "Oprah's Favorite Things" by sharing some of the items my family and I love! Unfortunately, I'm not a billionaire like Oprah so, no giveaways or swag here! Today I'm sharing the Great Tasting Tea - from Whittard.com! 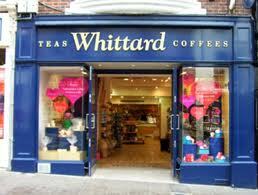 My favorite teas are from Whittard of Chelsea. I fell in love with these teas when Don and I took a group of my students on a tour of Europe years ago. The strawberry tea is devine! I bought as much as I could to bring home to share with others: vanilla, earl grey, and cherry blossom. It's only available online for us Americans! So, take advantage of the 20% OFF First Orders offer! If you have a tea lover in your life, they would love Whittard tea! Check back for more posts of Lysa's Favorite Things! Guest Post: Please remember to vote! Remember to vote this Tuesday! 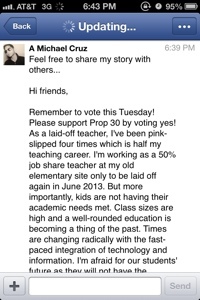 Please support Prop 30 by voting yes! As a laid-off teacher, I've been pink-slipped four times which is half my teaching career. I'm working as a 50% job share teacher at my old elementary site only to be laid off again in June 2013. But more importantly, kids are not having their academic needs met. Class sizes are high and a well-rounded education is becoming a thing of the past. Times are changing radically with the fast-paced integration of technology and information. I'm afraid for our students' future as they will not have the knowledge, skills, and talents to be independent learners and to fully function in a productive and socially-conscious society. Your support in favor of Proposition 30 would be greatly appreciated. Please contact me for more information. I admit my pitch for a "Dear Joyce..." section to this blog was for kicks and giggles, but I should have known that Lysa would make it happen! Makes me wonder what else I could have "suggested" and have come to fruition- ha! As a teacher, I've learned from first hand experience that collaboration brings forth beautiful things and interesting opportunities. I'm so excited to help the virtual community :) Please forward your cooking questions to @lotus1330 on Twitter. I'll repost on GarciaMemories.com. Thanks for reading and happy blogging! *FYI- I'm obsessed with baking/cooking and have been experimenting with gluten-free and vegan cuisine. My first request comes from @MiraMesaMom: "I need a recipe for hard boiled egg yolks! DD only eats the egg whites!" At work, I like to use candles and diffusers to have relaxing scents to fill my space. It helps me keep focused and alleviate the stresses I encounter daily. Often times I get compliments from not only my co-workers, but also the students and parents I work with with comments like "Wow, your office smells so good!". So, thanks to Influenster, I received a Bath and Body Works Mini Candle in the Nutmeg and Spice scent which I immediately brought to work. I love the Fall themed scent! That same day I brought the candle to work, people would pass my office and do a double take to ask "What is the smell? It smells so good!" I look forward to putting a few of these my some of the stockings of friends and family this Christmas! Sign up here to receive their coupons to get ready for the holiday season! Cupcake Virtual Marathon Starts TODAY!